From death, life flourishes and thus the dance of fate swirls anew. Are you prepared to unearth Armello’s bright new beginnings? Armello’s largest update is live right NOW! Armello’s most requested feature is now a reality. If your internet connection becomes corrupted, take solace in your ability to rejoin and continue your journey for the throne. Reconnection ensures that your fate can never be stolen. Train, plan and grow. Reap rewards for your triumphs. Complete games to level your heroes and uncover rewards from times once lost, and new horizons alike. These rewards include brand new boast animations, dice from previous collections and extra dice equip slots, so you can equip and roll two different dice in a single stack! Prepare your favourite heroes for battle, your way. Browse, customise and master each hero in your Clan Grounds. Select and save hero-specific loadouts including skins, dice, and jewellery to ensure that you are prepared to play at the drop of a hat. Navigate with ease and uncover Armello’s rich history. The Front End menu has been recreated from the ground up, with a brand new tune and all the trimmings. Retrace The King’s history and uncover the unmentionable secrets of Armello’s past… or just change the volume in the settings menu. Your favourite heroes at the tip of your fingers. You’ve decided to save Armello yet again, now, which hero is worthy of your guidance? In conjunction with saved hero loadouts from the Clan Grounds, Hero Selection has received a shiny overhaul. Taking card play to the next dimension. Whether you’re drawing ‘em or playing ‘em, card play has never felt so good. Cards in Armello have levelled up, and are now rendered completely in 3D. Forging a party and getting into a game has never been more seamless. Now you can set up a party in any menu, making game organisation and navigation that much easier. What better time to celebrate our community than with v2.0? Community suggested features have materialised in almost every facet of Armello. Precious treasures deserve luxury storage. Now you have a place to store and peruse your hard-earned Signets and Amulets. Review a brand new array of revised unlock conditions and hunt for what you’re missing! Suggest and vote on improvements to become a localisation contributor for Armello. There may even be rewards for the particularly devoted! On top of the major features mentioned above, over the course of every update we add numerous bug fixes and experience improvements. v2.0 has over 200 bug fixes in this build alone! Naturally we will continue to improve stability and quality of life via numerous small patches in the lead up to our next update. Armello officially launched in 2015 and since then our primary goal here at League of Geeks has been to continue developing new and interesting features to progress and refine Armello's world and its intricate mechanics. 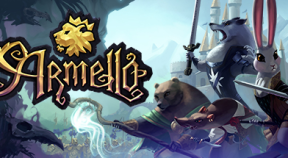 By purchasing Armello now, you are purchasing years of love and care, with the knowledge that we will continue to devote our hearts and brains to improvements moving forward. The best tabletop adventures are also wondrous story generators, creating those shared memories of epic adventures with friends and loved ones. In remaining true to this core inspiration, and to provide the twists and turns of any great adventure, Armello features numerous elements of chance; including drawing cards from shared decks, physics-based dice rolls, skill tests in quests, procedural map generation, dungeon auto-exploration, and random story events. The strategy and immense depth within Armello lies in exerting your mastery of its systems in such a way that you slide the odds as far in your favour as possible - and are prepared to pivot on your strategy at any given turn. If your blood boils at the very mention of "RNG"... Armello may not be your cup of tea. If you are a player that embraces the storytelling potential of RNG or revels in exerting your mastery over its chaos, Armello is very likely to be right up your alley! Easy to Play but Hard to Master - Armello is an intuitive game, easy to pick up and experience but with deep and emergent strategy. Multiple Playable Heroes - Includes 8 playable Heroes. Each unique Hero possess a special power, stat line and Ai personality. Also heroes can be customised with Amulet and Signet Ring load-outs to match your play style or counter an opponent's strategy. Dynamic Sandbox - Armello features a gorgeous dynamic world which procedurally generates a new board each and every game, complete with a dynamic quest system ensuring no two games of Armello are ever the same. World Class Music & Audio - By Michael Allen, internationally acclaimed artist Lisa Gerrard, Stephan Schutze, Jacek Tuschewski and Kpow Audio. Animated Cards - Armello features over 150 beautifully animated in-game Cards, from artists all over the world. True Tabletop Feel - We've cherry-picked the best parts of the tabletop experience, like the hex-based board and our custom physics-based dice! Armello is League of Geeks’ attempt to revolutionise digital board and card games, whilst providing players a rich world within which they can craft their own stories of epic adventure. The aim was to create a rich game full of backstabbing, close shaves, shattered alliances, ruses and empty promises - a perfect game to play online with your friends.